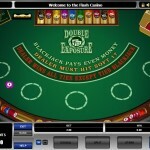 Double Exposure is a unique blackjack version that is not like any other version. This does not come as a surprise since the game is provided to online casinos by Microgaming, which is known for its innovative games that come with unique features for a one of a kind gaming experience. On top of that, the game comes in great visuals accompanied by great sound effects to make sure players enjoy a Blackjack gaming experience that is as exciting as land based casinos. 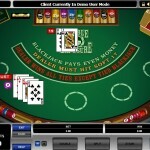 This is a unique game that is quite different from other Blackjack games. This is because in this game, the 2 cards of the dealer are facing up and the player can see them while playing, this is why the game is entitled Double Exposure, since the dealer’s 2 cards are exposed. Players will keep hitting or standing then the dealer will start doing the same. The dealer has to hit on soft 17 and he will win all ties with the exception of Blackjack and Blackjack pays even money, some players might see this as a low paying game but the fact that the 2 cards of the dealer are facing up gives players quite an advantage. This is why the game had to even the playing field by making the dealer win ties and by reducing the usual 3 to 2 Blackjack payout to even money (1 to 1). Players can split three times to form a total of 4 hands and the game is played with a total of eight decks of cards. Players can also split aces but they can only get one card to the aces that they have split. The minimum bet that can be placed on the blackjack hand is equal 5 credits while the biggest bet is equal 500. Players can choose how much they want to place by selecting a chip size then placing it on the table so they can start the game. The available chip sizes vary greatly as they include 5, 10, 25, 50, 100, 200 and 500 credits per chip. 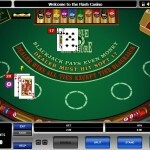 Players will then click on the deal button and then follow the gaming procedure of any regular game of blackjack while abiding by some special rules that the game has. The thing that makes this blackjack variant unique is the double exposure feature. This is because when the player gets his two cards and the dealer gives himself two cards, they are both exposed, hence the name, double exposure. Unlike most if not all blackjack variants, the dealer has one card facing up while the hole card is facing down. This gives players an amazing advantage as they can see the two cards of the dealer and calculate his hand total while they are taking their in-game decisions. This way, they can see if they need more cards to beat the dealer or if they need to stand because they have a better chance than him. This is why this game appeals greatly to new blackjack players because it has a unique player advantage. Blackjack pays players even money while other games pay three to two. The dealer will win any push with the exception of a BJ push, while other games consider all push results as a tie. Doubling down is only an option at hand total of 9, 10 and 11.